Today is Easter and, as such, a major holiday in France. Tomorrow, Easter Monday, is a day off. People have been moving about the country (and indeed, Europe) to take advantage of the long weekend. Traffic on Friday and Saturday was reportedly very bad in the southbound direction toward the Mediterranean coast and the mountains. Apparently, there is still good skiing to be had. 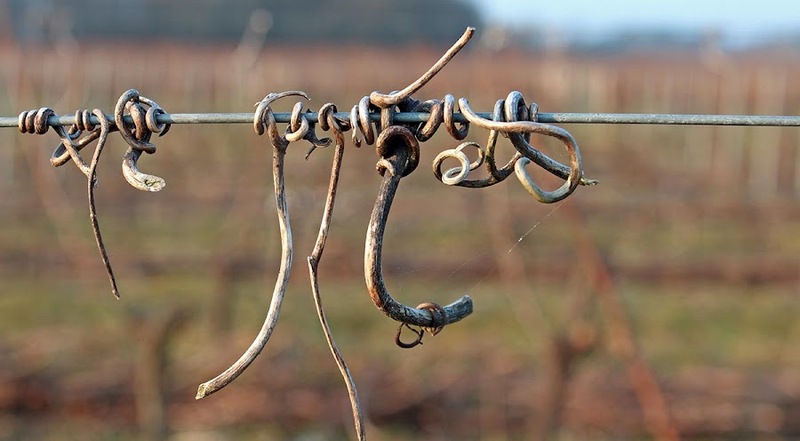 Nothing to do with Easter, just some dried up grape vine tendrils. On Saturday morning I went to the St.-Aignan market to buy a rabbit for our traditional Easter dinner. I got a nice looking one and Ken cut it up and marinated it. He'll likely have photos of it on his blog. I also picked up some mushrooms, radishes, nice looking little turnips, and some salad. The market was pretty, even though it was raining lightly. The brightly lit stalls made all the food look quite appetizing under the overcast sky. In spite of the weather, everyone I encountered was in good spirits. I should have taken the camera, but I don't usually take it out in the rain. It feels more like fall. Late fall. Early winter, even. The mornings are at or below zero and are expected to be the same for the next week. Yesterday it snowed (no accumulation). We've run out of firewood and had to buy another bunch of fuel oil to run the central heating. It looks like spring, but it still feels like winter. 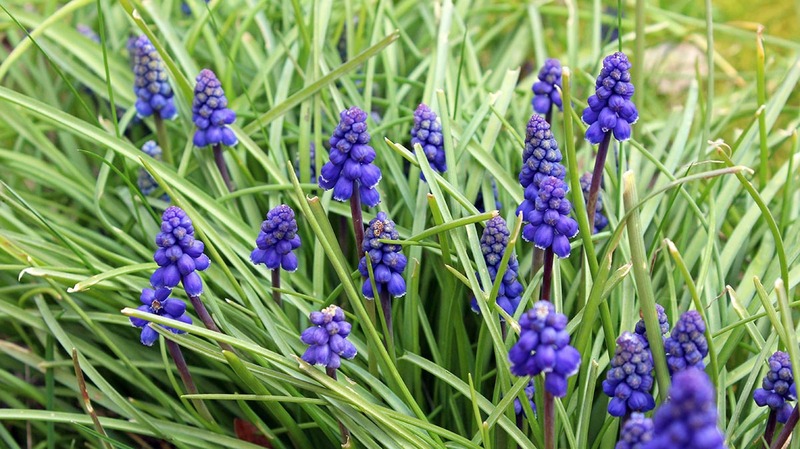 These are muscari (grape hyacinth) in our yard. I hope it warms up a bit... by summer. 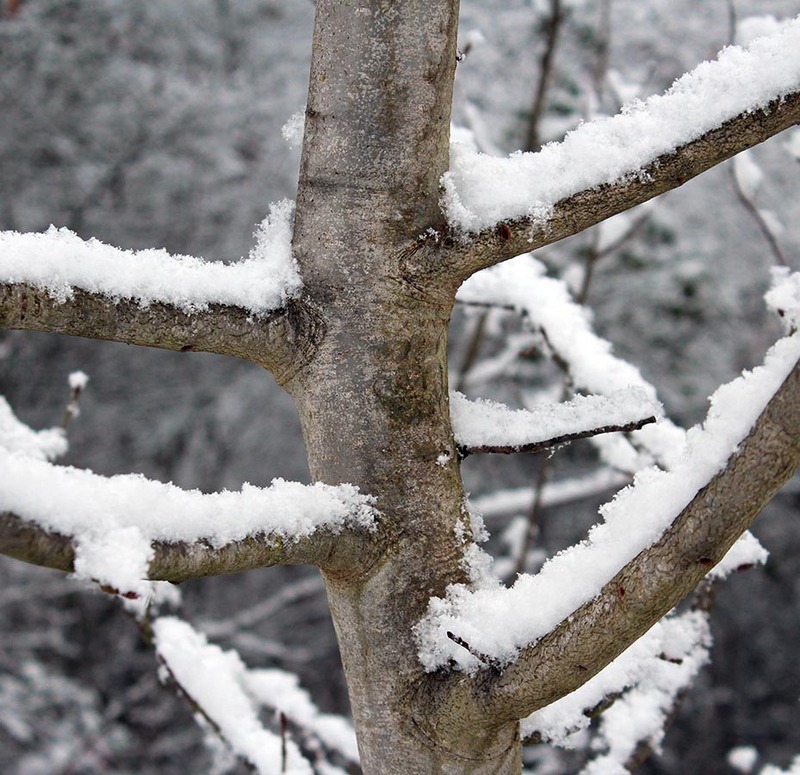 They told us that the year we moved here (2003), April was cold with a freeze that damaged buds and fruit trees. We arrived in June of that year to the hottest summer France saw in nearly fifty years. Anything can happen. Probably not this kind. Who knows? 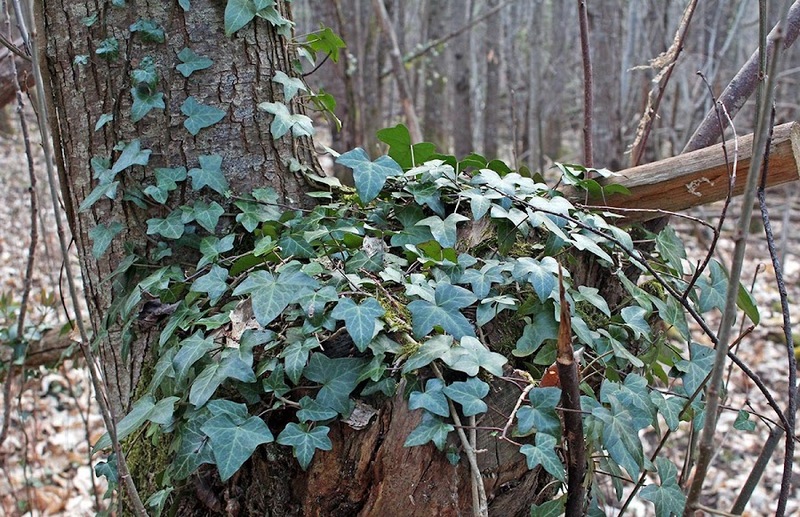 The ivy that grows everywhere around here, in the woods, on the trees, and in the yard, is coming back from the winter blahs. The leaves are perking up and looking healthy and new tendrils are poking around. Ivy on a tree stump in the woods. There's a good deal of ivy in our lawn. Our "lawn" is not actually a lawn. There is some grass in it, much the same way that there are some African Americans in the Republican Party. Mostly our lawn is made up of little flowering plants, mosses, and ivy like this. The lawn ivy has smaller leaves, however, because the bigger leaves get cut up by the lawnmower. Where's a gendarme when you need one? Apparently, they're hanging out at my place. This is prime reproduction time for the gendarme (pyrrhocoris apterus) or firebug in English. They congregate on the trunks of linden trees (we have one out back covered with them) or other places where it's warm. 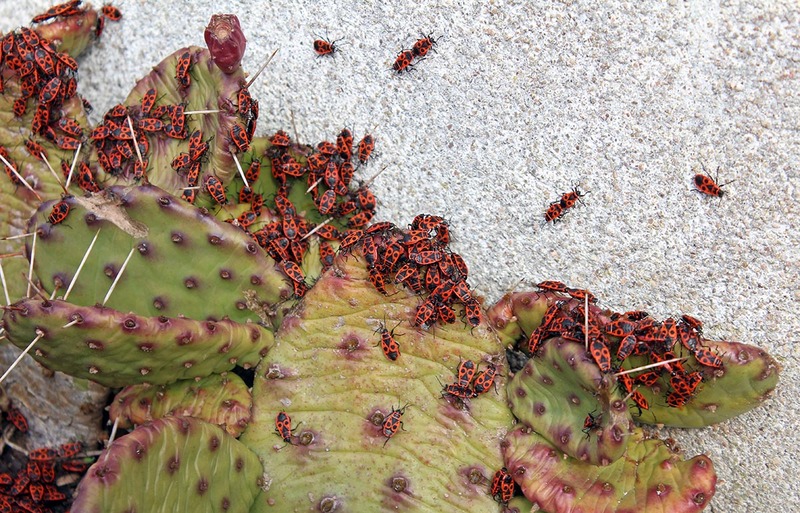 Gendarmes congregating on a prickly pear planted against the southern (warmest) wall of our house. You can see a couple of mating pairs on the wall. These bugs couple together at their back ends to mate. They stay like this for a long time, moving around together like pushmi-pullyus. According to Wikipedia, they're called gendarmes because their red and black color is similar to the colors once worn by French gendarmes. Spring has sprung, but someone forgot to tell Jack Frost. He's left his calling card on the grass this morning. If he tries to nip at my nose, well, I'll have a few choice words ready. 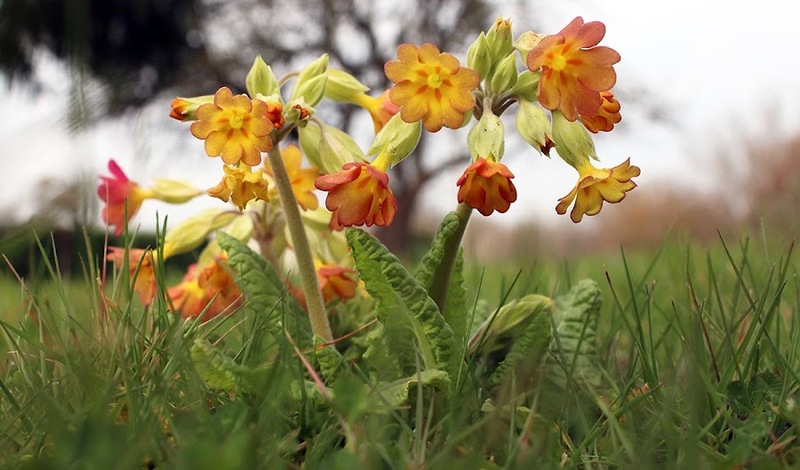 In the meantime, here are some cowslips that popped up in the back yard. At least, I think they're cowslips. They're called coucous in French. It could be much worse, of course. When the sun is out (which it has been for the past couple of days), the temperature warms up by noon to be quite pleasant, although you wouldn't call it "warm." These morning frosts are expected to continue to the weekend until a warmer rain system moves in. Technically, no. It's not my back yard and it's not archeology, but it's close enough. 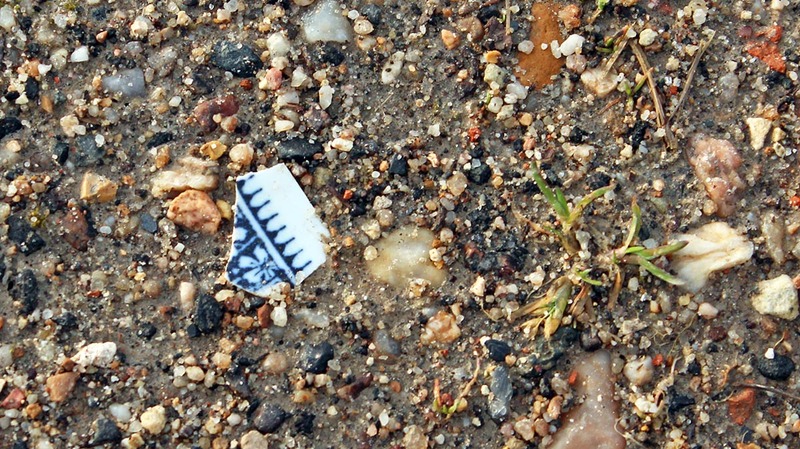 I saw this shard of a plate or ceramic tile on the road out in the vineyard. It's a gravel road and there are all kinds of bits and things findable out there, especially after heavy rains wash some of the sand away. Obviously not a natural formation. We got perilously close to freezing this morning. I'm hoping all the budding and flowering plants aren't harmed. Morning temperatures are expected to frôler les zéro dégrées (brush with zero) all week. The vineyards out back are not owned by one person. There are many individual parcels owned and tended by different local growers. After ten years, I pretty much know who owns which bunch of vines out there. Some of the parcels are marked off by little flags or rags, like this one. 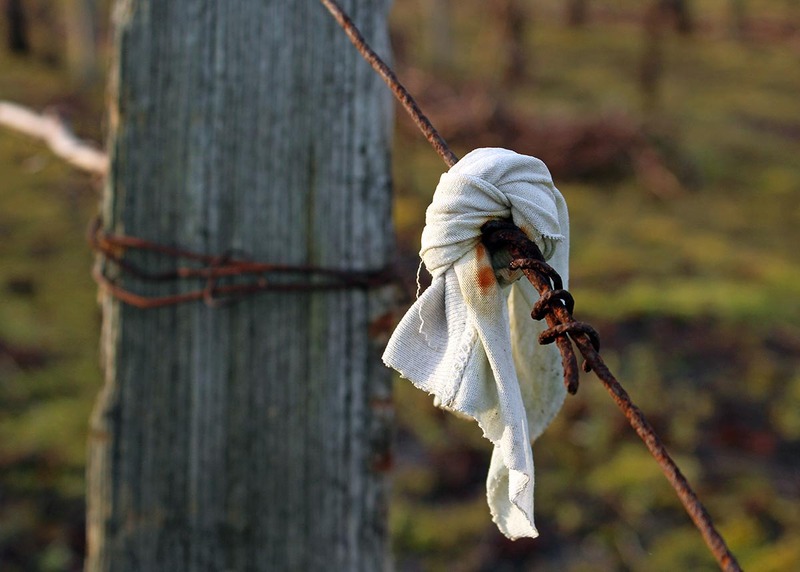 A rag tied to the support wire at the end of a row of vines. I don't know what they mean, really. They're not permanent; they appear and disappear or get moved around from time to time. I suspect they have something to do with marking the starting/stopping points for seasonal workers who aren't familiar with the vineyard layout. This is a French classic: the onion pizza. 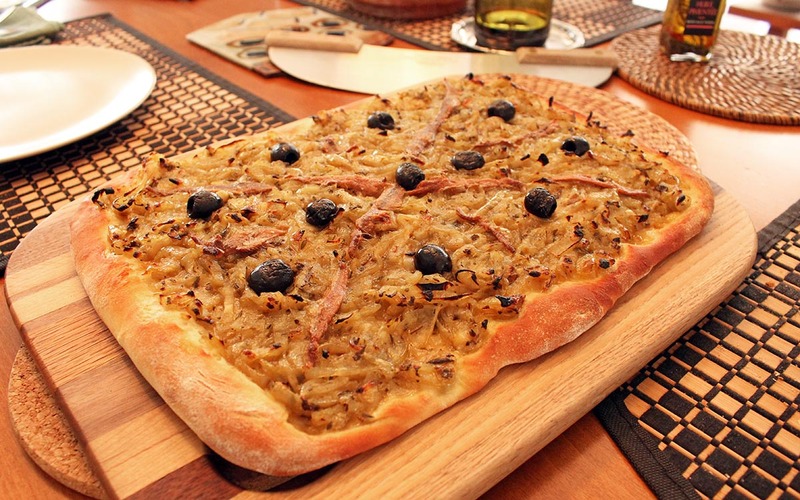 The recipe is from the south of France and is made with onions slowly cooked in olive oil with herbs, then spread on a pizza dough and garnished with anchovies and black olives. Yum. Onion pizza with anchovies and black olives. This one was good, but not the best I've made. Ken didn't like the anchovies, and he said that I put too much hot red pepper in. That's probably true, because I do tend to over do the hot stuff. So, next time there will be less pepper, and maybe no anchovies. We'll see. 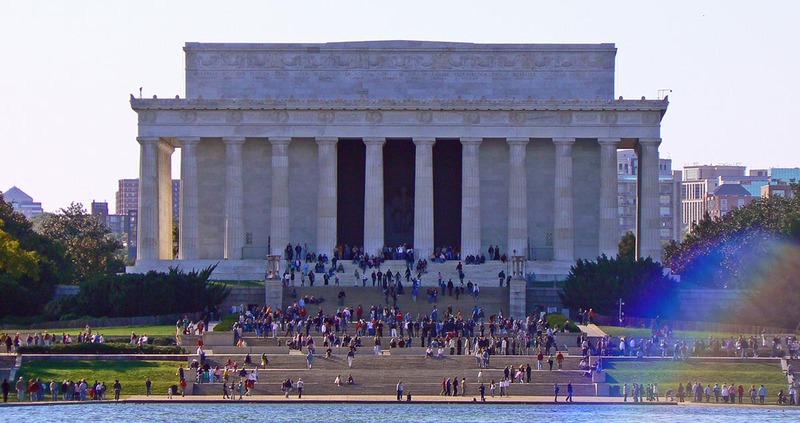 The Lincoln Memorial on the National Mall in Washington, DC, is an icon. It is the site of many a demonstration and speech, perhaps the most famous being Martin Luther King, Jr.'s "I have a dream" speech in 1963. Looking west. You can see Rosslyn, Virginia, beyond the Lincoln Memorial, across the Potomac River. See the little stars in the foreground on the bottom? If you look closely, you can just barely make out the statue of Abraham Lincoln inside the building. I'm putting two photos up because I like them both. I was standing at the opposite end of the Reflecting Pool on the site of the WWII memorial when I took these shots. This shot includes the steps that lead up to the memorial. I like the little rainbow on the right. So that's it for the little retrospective from October, 2006. Tomorrow we'll be back in real time, back in France, still waiting for spring to assert itself. 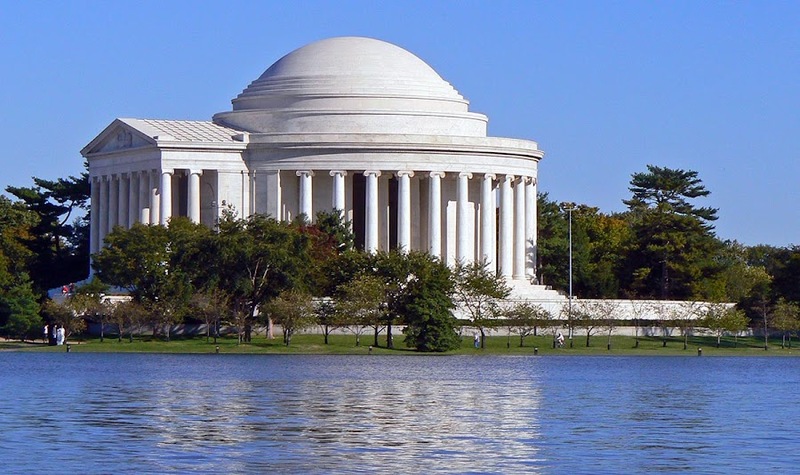 This is the Thomas Jefferson Memorial in Washington, DC, seen from across the Tidal Basin near the FDR Memorial. I don't think we walked all the way over to Tom's place on this trip, or I might have gotten an interior shot. The portico faces north, toward the Washington Monument and the White House. Photo taken October 2006. When in the course of touristic events, it becomes necessary for a people to rest their feet, a decent respect to the opinions of mankind requires that they should declare the causes which impel them to the resting of their feet. Or something like that. The Washington Monument, completed in 1884, is the tallest structure in the District of Columbia at nearly 170 meters (555 feet). It's built in the shape of an obelisk and is hollow. Visitors used to be able to take an elevator to the top for views of the city, but an earthquake in 2011 damaged the structure and it's now closed for repairs. 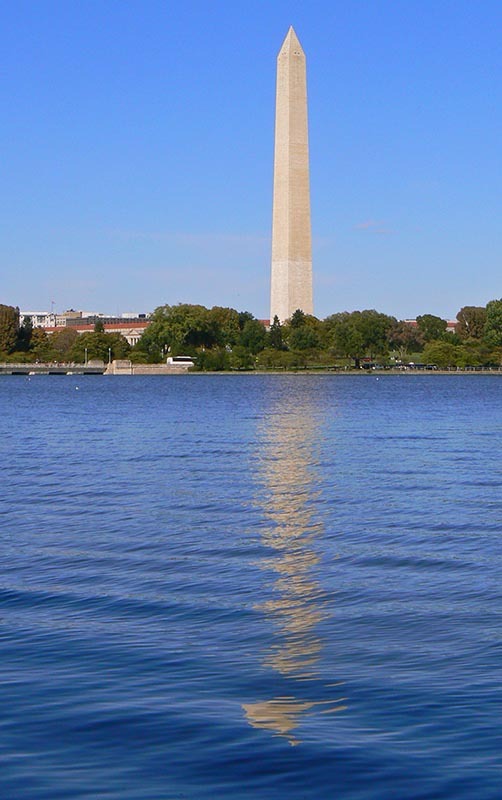 The Washington Monument reflected in the tidal basin. I've been to the top, although it was many years ago (like in the 1980s) and the few photos I have from then are packed away somewhere. You get better aerial views of DC on Google Maps, anyway, and you don't have to wait in line! While we wait for spring to do its thing (the least of which is to actually arrive), I thought I'd post some photos from the last time Ken and I were in Washington, DC, back in 2006. I was using my old Panasonic Lumix FZ7 camera which was new at the time. A sunny day with clear blue skies. Washington, DC, October 2006. That's a kite flying up to the left of the dome. 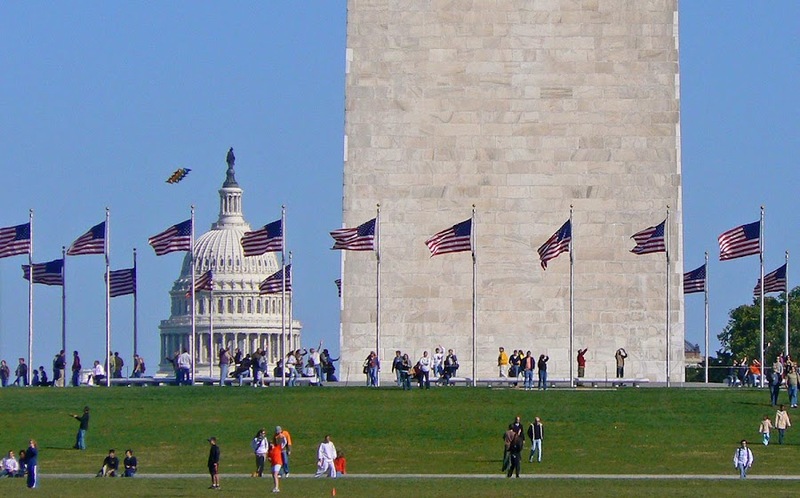 This is a view of the Capitol dome and the base of the Washington Monument on the National Mall. The distance between these two buildings is 1.8 kilometers (just over 1 mile). I'm looking east from the vicinity of the WWII monument. This was the first time I saw that particular monument which opened in 2004; it wasn't there when I lived in DC back in the mid-1980s. I've seen these spherical growths on the oak trees around the vineyard for years now, figuring them to be some kind of insect incubator. 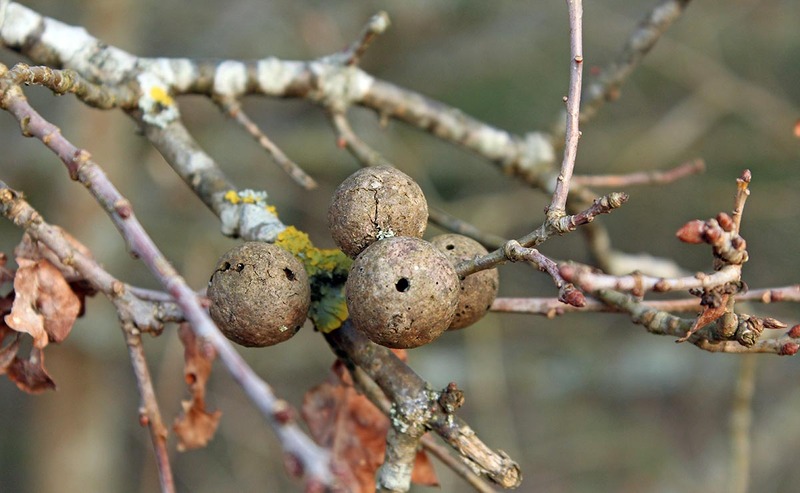 Turns out they're called oak galls and are, in fact, the incubator for the eggs and larvae of a particular kind of wasp called the parthenogenetic gall wasp. At least that's as close as I can come to an answer using the internet. Oak galls on a local oak tree. You can see the leaf buds getting ready to open. In French, these formations are called les galles du cynips, with cynips being the common name for the wasp andricus kollari. Again, my extensive quick and dirty internet research may not be precise, but it's probably close. So, for you language and geography lovers out there, one might say that we live in the land of galls, or in French: le pays de galles (which is French for Wales, U.K.). Wrap your heads around that! Last night I was up a lot. I'm currently in one of my cycles of not sleeping well in the middle of the night (it may have to do with taking a nap during the day). When I look out the window the sky is crystal clear and the stars and the crescent moon are brilliant. Then, in the morning, clouds gather as the sun rises. The sun setting over the vineyards on Friday evening. The vineyard road is wet, wet, wet from the weekend rains. That doesn't bother Callie one bit. In fact she likes to tromp through puddles (and take a drink now and then). She's a dirty mess when we get home from our walks and she gets a shower every time. This grape vine is pruned and ready to start leafing out. 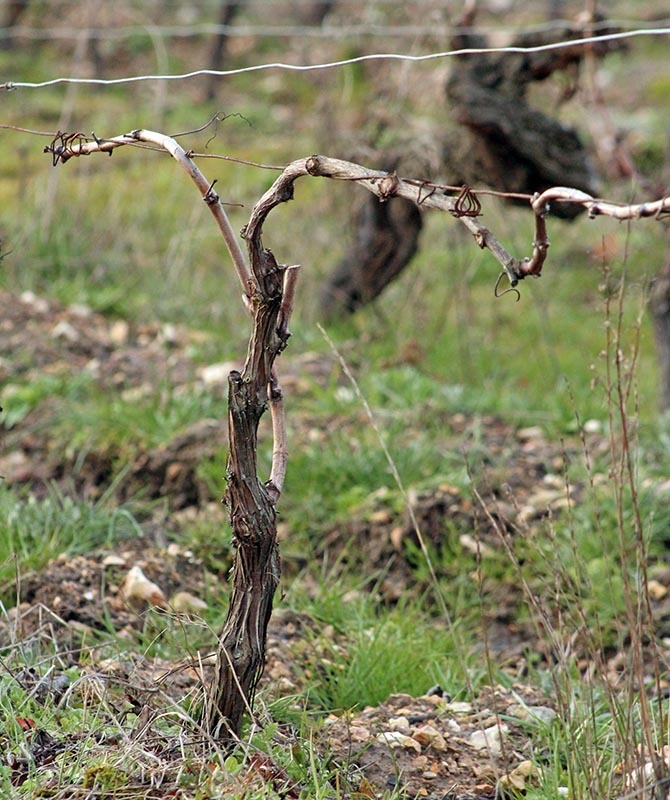 Once it does, shoots will rise up from the horizontal canes and the vineyard will be green again. This vine has two canes attached to the support wire. Many of the vines around us are pruned to only one cane. Today is Saint Patrick's Day in the United States. Well, I suppose it's St.-Patrick's Day all over, but nobody celebrates it like the (mostly non-Irish) Americans. All week, the internet has been filled with photos (mostly from Americans) of green bagels, green beer, green clothing, and all sorts of references to green stuff. And, while it is also St.-Patrick's day in France, I have yet to see a green croissant or a green baguette. Certain trees are starting to flower around our neighborhood. This one is a variety of plum in our back yard. It's one of several in the gardens around us. I can also see that several other kinds of early flowering trees are fat with buds on the verge of opening. 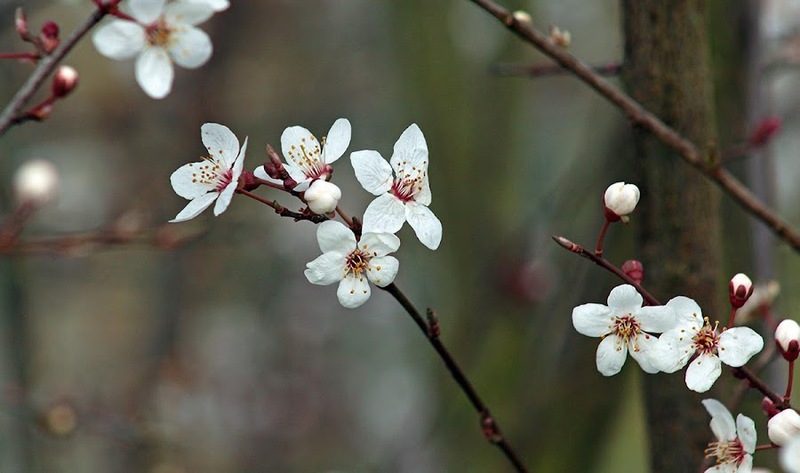 Plum blossoms in the garden. I hope they don't freeze before they get pollinated. I would be more enthusiastic about it if the morning temperatures were above zero. Well, this morning we're at +2ºC, so I guess that counts, but not much. I want to see double digits! As much as I'd like spring to spring, we're still in winter. The weather teases us with a little warm day here and there, but then it reminds us with a snow squall or a dip below freezing that we're still a few weeks (and now one week) before the equinox. 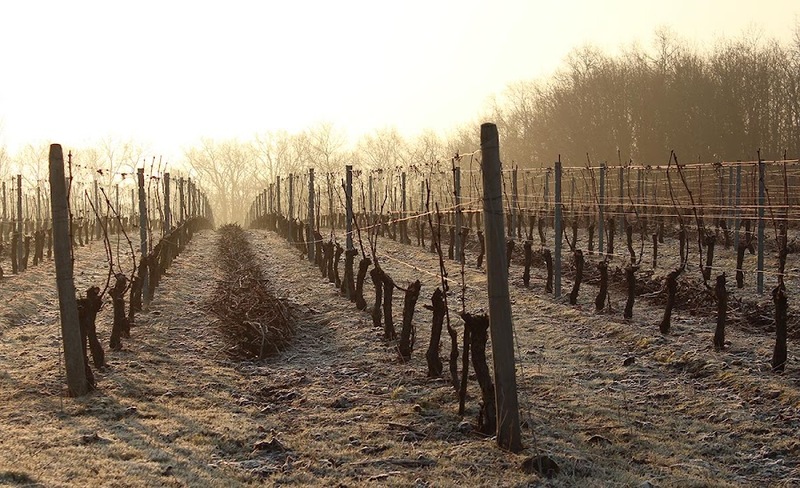 The almost-spring vineyard on a frosty morning. I can't wait for the buds to open! Thursday was not a warm day, but it wasn't all that cold, either. I was surprised by several snow squalls, even with the thermometer well above freezing. Still, it was not warm. I continue to build fires in the wood stove and they're quite nice. But it's this time of year when I'm sick of cleaning out the ashes, lugging up the wood, and building the fire. As they say in French, vivement le printemps ! They're called primevères in French. We have one particularly large patch on the north side of our house where it's shady most of the day this time of year. But every year some of the flowers escape and they pop up here and there in unexpected places. These are a more pale purple (mauve?) than the flowers in the last photo. We also have red, white, and yellow primroses out there. Primroses are among the very first flowers of spring and it's always nice to see them bloom. I'm ready for this cold snap to end (hopefully by week's end). I'm tired of putting on the long johns for the morning walk! But we don't miss the snow. The north of France got hit pretty hard, according to the news. Serious accumulations (for France) have snarled traffic, stopped trains, and grounded airplanes. Here in Le Centre, we only got heavy mist mixed with a few flurries. 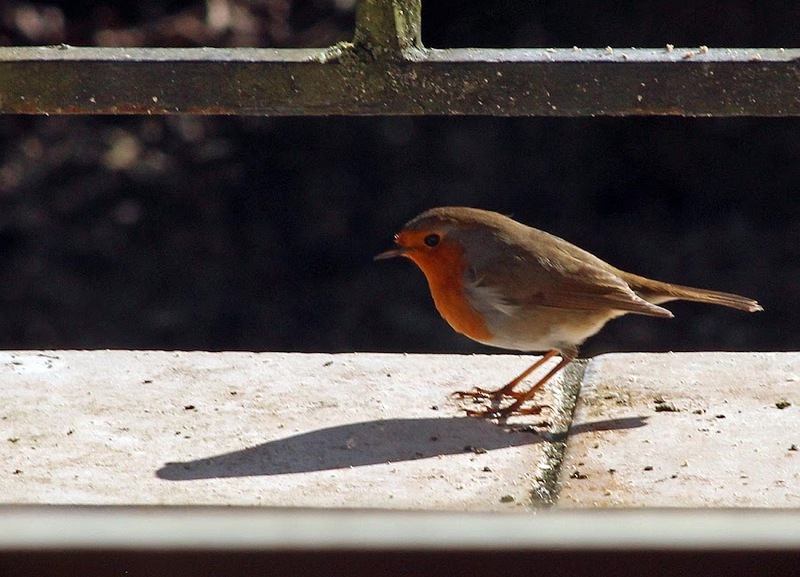 A rouge-gorge (European robin) pecks for seeds on our deck. The photo's a bit blurry because I was using the telephoto lens without a tripod. This morning we woke up to about -3ºC (around 26ºF). The air is cold, but the ground is still warm so the puddles are not frozen. They're predicting mornings below zero for the next few days, but the weekend is supposed to warm up again. In other news, I went to the supermarket yesterday morning. As I was shopping, I kept hearing a rooster crow, and rather loudly. It turns out there were two live roosters in a chicken coop at the front of the store. The chicken coops/hen houses are for sale; I assume the roosters are on loan. Fortunately, for the roosters, the store's poultry counter was well stocked. 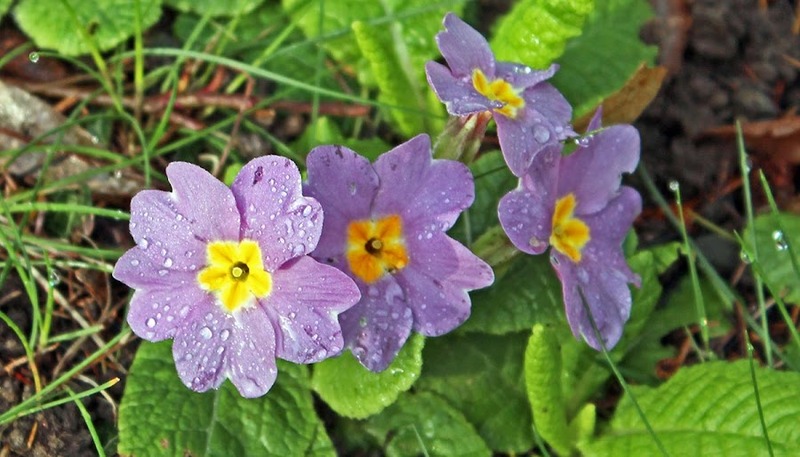 The primroses have started blooming. I thought you'd want to know. There will be more photos. 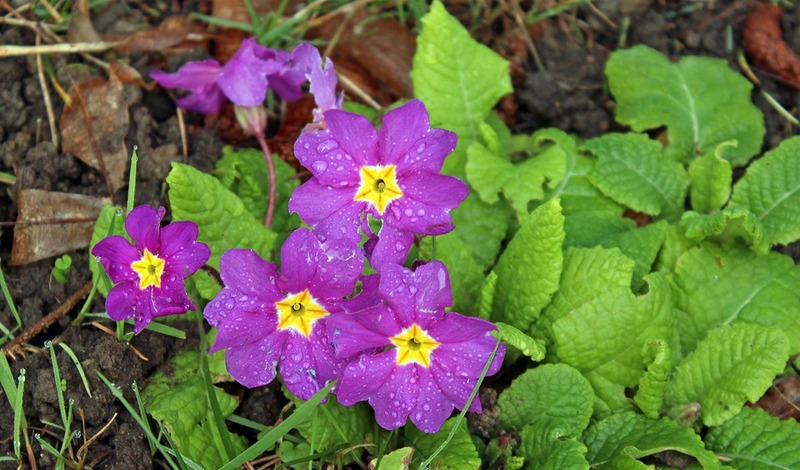 Primroses blooming in our yard. We had rain during the night and there were still drops on the flowers when I took the pictures. We're still trying to wrap our heads around the roof issue. You see, it leaks when we have very heavy rain. It's only happened a few times in the ten years we've been here, but that's still too much. So we have a roofer coming to evaluate it again. 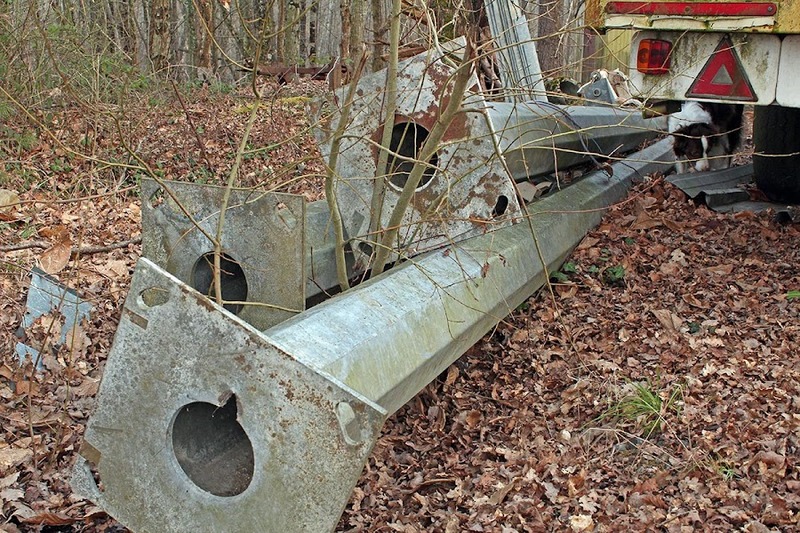 These look like some kind of utility pole on the ground next to a trailer in another section of the organized artsy neighbor's current installation. Can you see Callie inspecting the ground under the trailer? 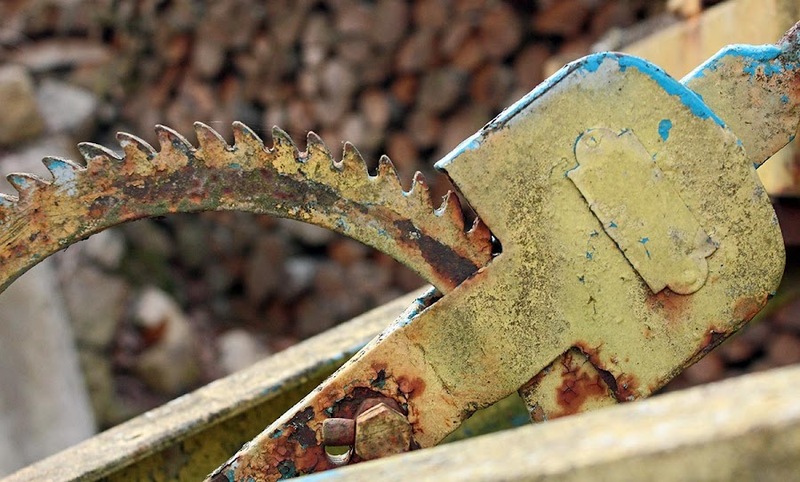 These aren't the only public works-related items out there. They might be a hint to the O.A.N's. prior occupation. I'll keep an eye out for any new developments as Spring approaches. There's so much I still haven't shown you (piles of roof tiles, sand, and gravel for example). I'll save that for another time. More like a shed, actually. It looks like it could have had wheels on it at one time. Now it stands as part of the organized artsy neighbor's collection of stuff on the edge of the vineyard. I once tried the door; it's locked. I do believe that iron rod thing is holding the shed steady. I have no idea why it's hollowed out underneath or poised on those concrete pillars. Maybe just because he had some concrete pillars sitting around? Another piece in the organized artsy neighbor's collection. This one is a huge contraption with all manner of gears and things, not to mention a crane-looking attachment. It was probably made to lift heavy things, but I'm not at all sure. The "rope" is made of metal, which is why it's also rusty. We're in that in-between time when the weather can go from feeling nice and spring-like back to cold and wintry in a flash. According to the forecasts, another cold and wintry spell is about to hit us. Oh joy. 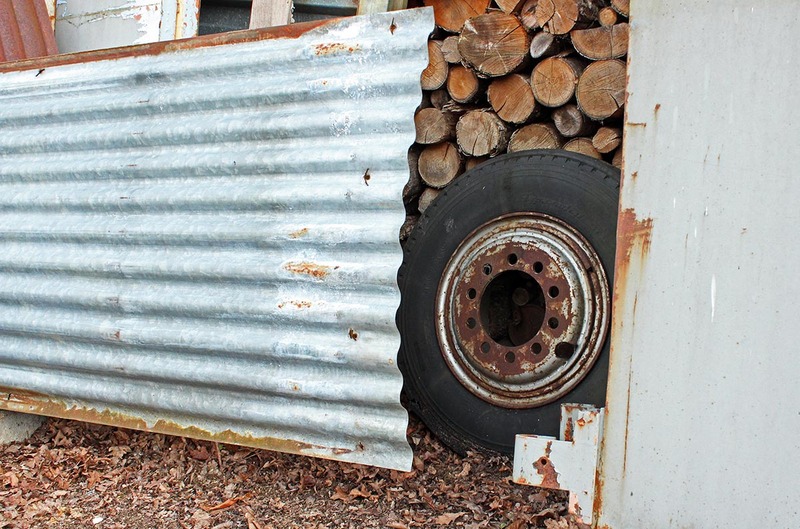 Our organized artsy neighbor also keeps bits of old machinery along side his wood pile. Maybe you do, too. I'm not judging. 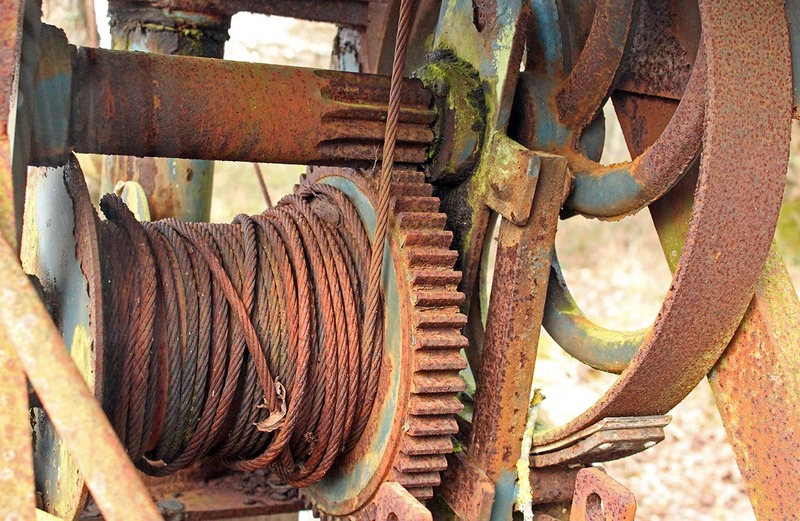 There is a small collection of rusty gears, cogs, and wheels to marvel at. I'm always tempted to touch, but never do. The funny thing is that this stuff is not static. It gets moved around from time to time. Although I never see it happen, I would swear that the neighbor repositions the piles and machinery periodically. Maybe he needs to make room for new acquisitions. Several of you have suggested that our organized neighbor may be an artist (at heart if not in fact). One never knows. I think he's more likely to be a retired construction or maintenance worker who putters around with stuff like he used to when he worked. Hey, it's a theory. But why not an artist? 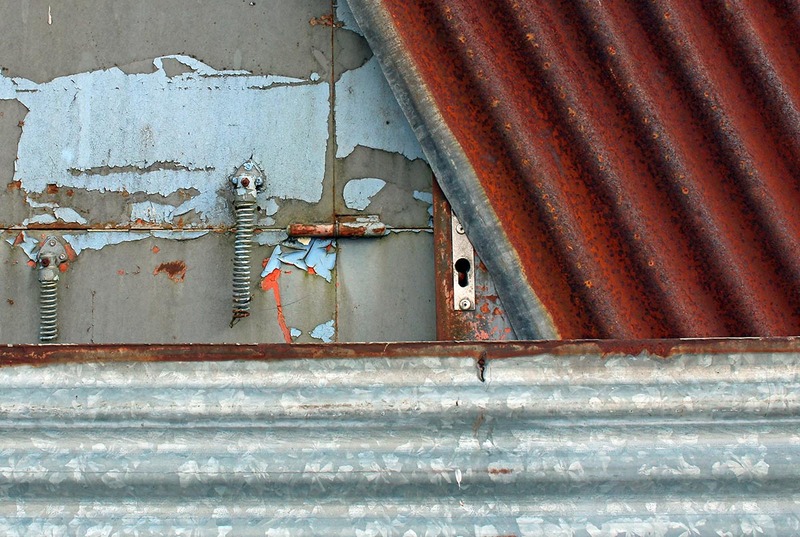 I call it "old springs and rust with hinge and keyhole." It's a shame that not many people get to enjoy his work. But, through the magic of blogging, you get to experience it. Here is some more of his collection. Any bids? I mentioned yesterday how the man who keeps his patch of woods neat and tidy also keeps piles of odd things out there. This is part of the northern side of his rather large wood pile. I wonder if these panels of doors and corrugated metal serve to protect the wood from the weather? Odd, but it makes for a nice photo. But then, what is the tire for? And why is all the wood not covered? Ah, little mysteries to ponder. 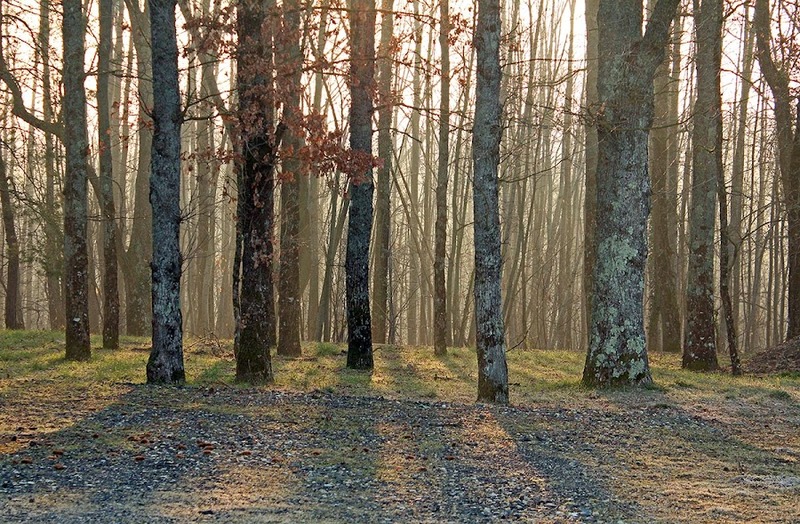 In the morning the rising sun pierces this patch of woods out among the vineyards at a very pleasing angle. The owner of these woods lives somewhere nearby, but I'm not sure where. He keeps a log pile here, as well as very neatly arranged piles of odd things: roof tiles, old signs, gravel. A neatly maintained patch of woods. The owner may live in one of the houses down in the ravine below. 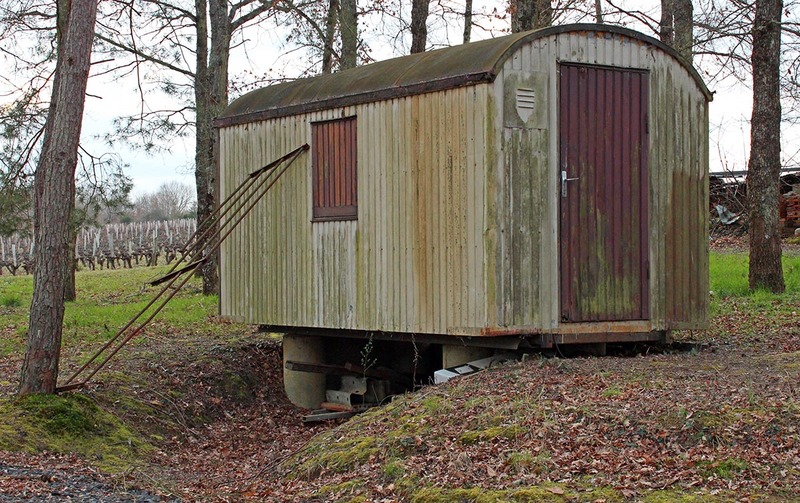 There is also a locked shed that sits on a bit of hollowed out ground so that on one side a person could crouch beneath it. The man we see here from time to time keeps the undergrowth cut and trims the hazelnut hedge that separates the wood from the vines. Everywhere there is evidence of his work where he's cleared undergrowth and thinned the trees. To what end? Who knows? We're having very clear nights at the moment. When I get up in the middle of the night and look out the western windows, I can see the constellation Orion hanging in the sky as bright as can be. It's one of the most recognizable star patterns in the northern hemisphere this time of year. Looking westward at sunrise. A clear sky, frost on the ground, and the stars faded out of sight. I wish it was warm enough to go outside and take longer looks, but unfortunately clear skies in winter mean very cold temperatures. And that means frosty mornings. Although maybe not this chilly. We're expecting a high near 10ºC (50ºF) today, but this morning we're just above freezing. Next week our highs are supposed to get closer to 15ºC (near 60ºF). The weather people are getting us all jazzed up for springtime conditions. They had better be right. 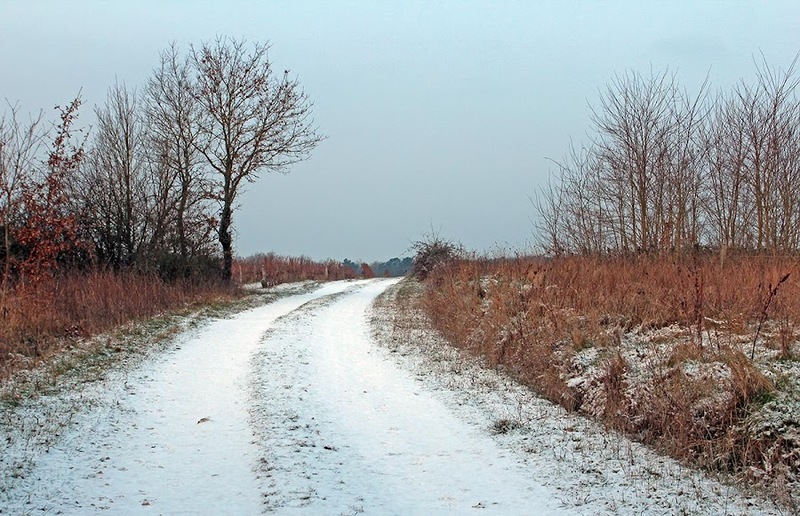 One week ago today we got a dusting of snow. The daffodils, hyacinths, and tulips are all up, although none of them is close to blooming yet. The roses are making leaves and the buds on shrubs and trees are fattening up. Patience... patience. The snow has been gone for days, but I still have all these pictures. I keep thinking about all the stuff I have to do out in the yard and garden in the coming weeks. I should have a chance to get out there real soon since we're not expecting any rain and its warming up a bit. I could get some things done out there now, but the ground is still a bit too wet. I'm waiting for it to dry out a little. Way to procrastinate! Today, being the first of March, we turn to the old saying. Since it's a mild day (no wind, no precipitation, temperatures above freezing), we could say that March is coming "in like a lamb." Which means, of course, it should go "out like a lion." We will see. Let's hope we don't see any more of this. February snow! 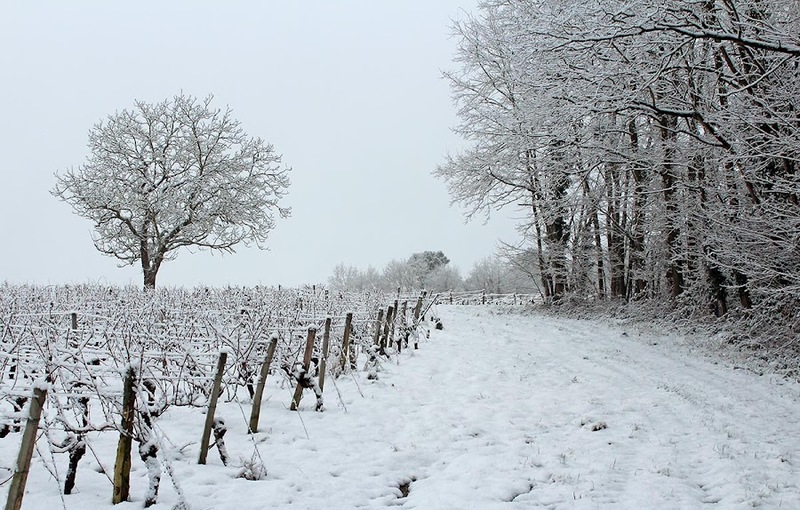 In France we expect les giboulées de mars (March squalls). Again, we shall see. 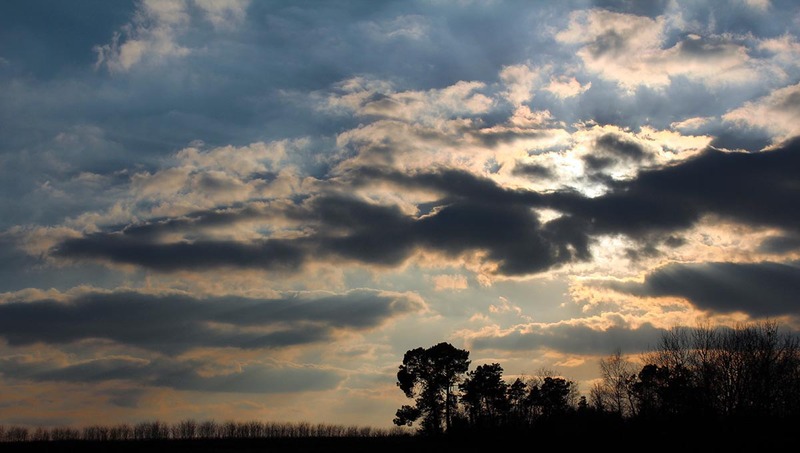 Spring brings very changeable weather. I'm just hoping it brings spring.